In response to my concerns to Bart DiPasquale, as council’s representative to the Amherstburg Accessibility Advisory Committee, he advised me that the committee’s meetings were rescheduled via several emails as mentioned in this post. I have not received any further response. For the above reasons, DiPasquale is added to the Accessibility Hall of Shame. My response is: the point is to publicly raise awareness of the equal rights of persons with disabilities and the complaint/enforcement mechanism. Some municipal candidates in the recent election were obviously misinformed about the accessibility legislation so if I can contribute to eradicating some of that ignorance, I will exercise my right to do so, as I have for over the past two decades. Who would argue that public education isn’t needed? On December 2, 2014 I posted that 1762668 Ontario Inc., a company owned by Rennie and Anne Rota, was added to the Accessibility Hall Of Shame because it failed to comply with a February 20, 2014 Human Rights Tribunal Ontario Order, part of which stipulated, “The landlord must retain a consultant with expertise in human rights, disability and access who will provide training to Mr. Rota, and any managers, on the landlord’s obligations under the Code with respect to accommodating disability, and the landlord must provide to the applicant by June 1, 2014, a copy of a letter from the consultant verifying that the training is completed. Six and a half months late, a December 20, 2014 letter certifies that Rennie Rota completed a Human rights Training Program; the letter was received via regular mail December 30, 2014. 1762668 Ontario Inc., owned by Rene and Anne Rota, is being added to the Accessibility Hall Of Shame because, as mentioned in this post, the February 20, 2014 Human Rights Tribunal Ontario Order has not been complied with regarding the hiring of a consultant to provide training to Mr. Rota and any managers on the landlord’s obligations under the Code with respect to accommodating disability. 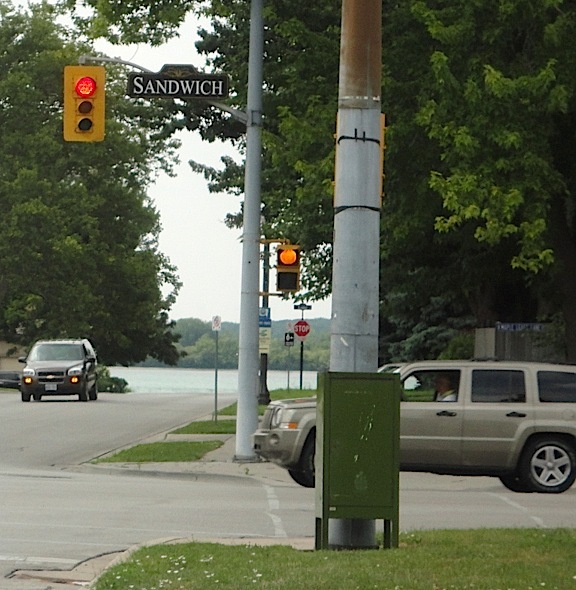 A July post with photos highlighted the pumpkin shaped pedestrian signals at Alma and Sandwich Streets that have existed for years; since they have not been fixed, they are being added to the Accessibility Hall Of Shame. A new page has been added, Accessibility Hall Of Shame, that will contain shameful barriers to equal access in Amherstburg. Any commentaries on this blog pertaining to a lack of accessibility in Amherstburg or anywhere else contain my personal opinion and not that as Chair of the Essex County Accessibility Advisory Committee. I telephoned South Shore Taxi yesterday to inquire if they had any accessible taxis; the answer was “no.” The response to my question, “why not?” was “we just don’t” which was followed by a hearty laugh and the suggestion that I would have to speak to the owner. Not having accessible taxis is not funny; I would also mention that the website has accessibility issues. For the most part, the position was that taxis are private enterprise and should therefore not be interfered with. However, ONTARIO REGULATION 191/11 made under the ACCESSIBILITY FOR ONTARIANS WITH DISABILITIES ACT, 2005, sets out Duties of Municipalities in sections 78, 79, 80. I do not recall a public meeting ever having been held nor can I find any reference in the town’s accessibility plan.